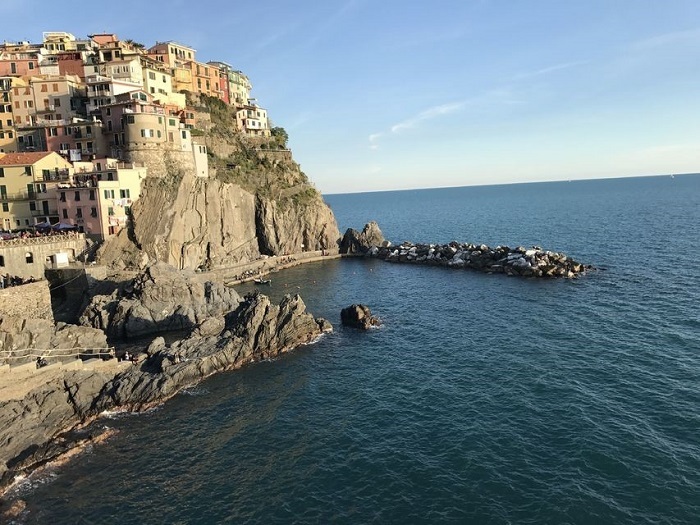 Situated in the region Liguria in the northwest of Italy Cinque Terre, which means Five Lands, includes five villages: Vernazza, Corniglia, Monterosso al Mare, Riomaggiore, and Manarola. Date back to the 11-th century the first village that sprang up are Vernazza and Monterosso. Under the political and military ascendancy of the Republic of Genoa other three villages grew up later. The villages are all connected with paths, trains, and boats, but the cars cannot reach the villages from the outside. There are only a few roads in Cinque Terre that are accessible by car. The first and main attraction here is the landscape. You can see trees and Mediterranean herbs that grow from the top of the hills down to the water level. 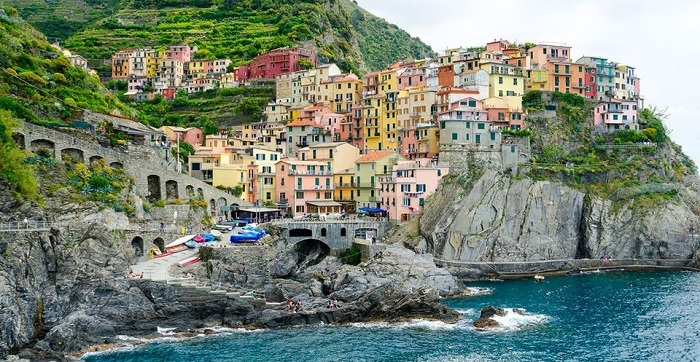 Depending on the season, you can also see a few attractions in Cinque Terre. In winter you can see the sea storms, in autumn the harvest and winemaking, in the summer the pirates attack in Vernazza, in the spring there is a patron festivity of the five towns, that is a mix of religious ceremony and popular parties. From December to the end of January you can enjoy in the world’s best Lighted nativity. You will meet your guide in the early morning at the Milan Visitor Center and travel by luxury coach. You will enjoy the stunning view of the landscape around the five villages of Cinque Terre. Arrive in the marvelous village of Portovenere, than you will take a cruise by boat to enjoy the astonishing view of the five villages. Take a train to the Monterosso al Mare, the largest of the five villages, and have a wonderful time to explore the beaches, squares, pedestrian tunnels, and restaurant. You can also have lunch and take some rest. Continue the tour with a 90-minute cruise along the Italian Riviera, then take a train to explore Vernazza or Manarola. In the late afternoon get back on land to take the return drive to Milan. Start the trip from Milan by air-conditioned coach. You will take the ferry- boat to Portovenere to enjoy the view of the pastel-colored houses and feel the charm of Lombardy and Liguria surrounded with the beautiful scenery and amazing villages. You can enjoy your free time in Portovenere and have some lunch. You must try the delicious Italian food as pesto and other regional tastes. Later you will take a boat trip to visit the villages of Cinque Terre and enjoy the stunning view of the brightly painted houses in Corniglia, Vernazza, Manarola and Riomaggiore. Once you are in Monterosso you can try the local wine and food. At the end of this marvelous day, you will visit the oldest village in the region, Manarola and spend time on your own. Excellent day trip for everyone who enjoys the convenience. This trip affords only 8 persons so you will have the opportunity to visit the most colorful region in Italy. The tour starts from the wonderful village of Volastra, where you can experience the green land and taste seasonal local products and wine. You will continue the trip about 1,5 hour walking to Manarola or you can take the minivan instead of walking. 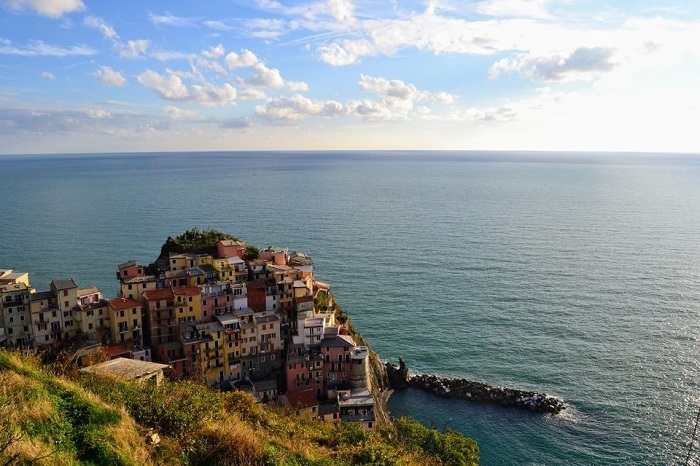 You can explore this astonishing village of Manarola and then take a cruise to Monterosso. In Monterosso you will spend some free time around the village and have a lunch in the local restaurants. The trains from Milan to Cinque Terre departs from Milan’s Central Station and take about three to four hours to make the journey. Sometimes you have to do two changes along the way. The price for the train trip between Milan to Monterosso is usually around 25- 40 E, and the second class tickets are around 27 E.
Consider that the cheap fares are available a few months before the travel, because it may be sold out quickly. The train is a fast solution to travel because the parking is extremely limited, but if you rent a car from Milan you can park it for the duration that you stay in the Cinque Terre villages. Always have on your mind that once you turn off the main highway, the road gets narrow, slow and winding. The map says that the duration of this trip are three hours by car, but it can take much longer time because of the difficult roads. When you drive to Cinque Terre always take the best map that you can find. Yes, the bus trip is always the cheapest way to travel from Milan to Cinque Terre, but it is also more complicated than you will expect. The truth is that there are always buses that can get you from Milan to the big cities like Rome or Florence, but you should also take a train to get to Cinque Terre. So we can conclude that the train trip is always a better way to travel because it will save your time and energy. Once you are in this enchanting village don’t forget to take your swimsuit. This is a place where the swimming is very popular and nice when the sea is not wavy. It is also a great place to repose and enjoy the gracious landscape. There aren’t many real beaches but this is a perfect chance to take a sunbathing on big rocks. This is a place that brings you the joy of love and romance. When you come up the rock you can see the most stunning sunset in the world. It is a magical view to watch the village light up in golden hour colors. Don’t forget to climb up to Manarola’s vineyards. It is a walk along a trivial path, but you can enjoy a view from a million dollar. You can see a terraced vineyard set against the turquoise sea and explore how the local people make the wine. Situated just off the main square this is the most attractive place in Corniglia. You can notice a long line of people that are waiting. The gelateria owns amazing flavors made from local ingredients like basil, honey, and lemon. Piazza Marconi is the main square in Vernazza that offers a great spectrum of restaurants, and fast access to the beach. One of the most famous structures of Vernazza’s square is the Church of Santa Margheria d ‘Antiochia, whose bell tower is the most distinctive sights of Vernazza. The Church of Saint John the Baptist and the nearby Oratory of the Confraternita dei Bianchi are the most popular historical treasures in this village. The Church of Saint John the Baptist was built between 1244 and 1307 in Gothic style and has the most beautiful facade decorated with white and green marble. Next to this church is the Oratory that is built in Baroque style. Beside this two historical monuments, there are few more popular structures like The Sanctuary of our lady of soviore in Monterosso, The abbey and the church of San Francesco, and The oratory of the Confraternita dei bianchi. When you go to La Spezia it’s an amazing experience if you go take some cooking classes. You can discover the secrets of authentic Italian cuisine. You will cook the most popular Italian food such as fresh pasta, Valentina cookies, and focaccia. After that, you can taste your homemade creations, accompanied by local wine. You will learn the authentic recipe for pesto Genovese, where you will use a mortar and pestle to turn pine nuts, garlic, Parmesan, and olive oil. Later you can enjoy your dish with a glass of wine and local products. You can explore the waters in this 5-hour kayaking trip along the Cinque Terre Riviera. The kayaking tour starts from Monterosso and paddle by rugged cliffs and astonishing villages of Cinque Terre. You will watch the seabirds and dolphins and stop in a cove for wine and food to enjoy the magical sunset. When you are in Cinque Terre the best option to enjoy all five villages is to rent a boat. You can have the trip just from Monterosso to Vernazza and you can make some quick stop to all of the villages. You can stop to enjoy the sunset or to taste some delicious food and quality homemade wine.